Volatility is the degree of variation of a trading price series over time. You can measure volatility in plain or fancy ways. In financial analysis, volatility usually means one thing — the standard deviation. Technical analysis also includes other useful measures of volatility. One way to measure volatility is to capture the largest price change over x number of days — the maximum move, also called gross move. You subtract the lowest low from the highest high over 10 days or 100 days or some other number of days. You use the resulting maximum move to set a profit target (maximum favorable excursion) or worst-case stop loss (maximum adverse excursion). Maximum move and trend: In the preceding figure, seeing the connection between the 30-day maximum move in the top window and the prices in the bottom window is hard. The straight line starting at the middle of the bottom window is the linear regression. The line slopes upward, meaning that the price is in a slight uptrend — but at the same time, volatility is on a downtrend. This is a good combination for you — trendedness is delivering new profits at an ever-lower risk of a big one-period loss. But remember, low volatility precedes a breakout, so it may not be a good deal for long. 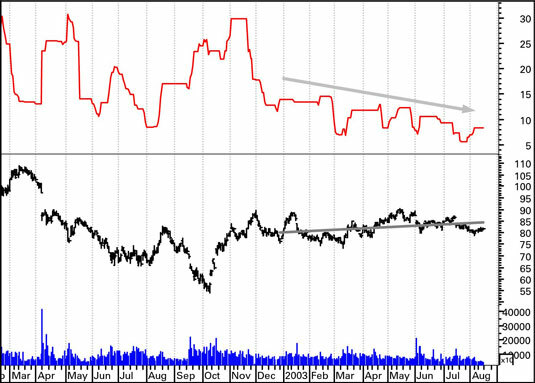 The price trend can differ in size and slope from the volatility trend. Sometimes they’re in sync, rising or falling together, or they can move in opposite directions. Knowing something about the trend in the maximum move doesn’t necessarily tell you anything about the trend in prices, and vice versa. In other words, volatility is often independent of price trendedness. 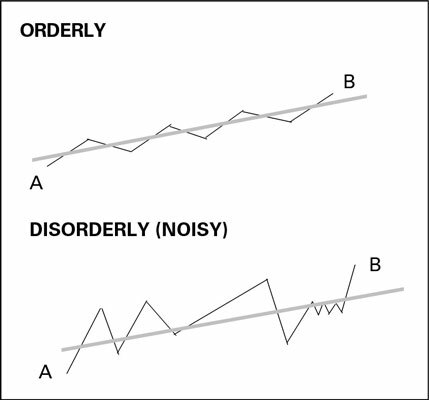 Maximum move and holding period: In this figure, the orderly price series has a net change from the lowest low to the highest high (A to B) of exactly the same amount as the disorderly price series below it. But obviously the disorderly series implies a greater risk of loss if you have to exit before the period ends. The trendedness of each security is the same, as shown by the identical linear regression slopes. This figure illustrates that measuring the maximum high-low range over a fixed period of time fails to capture the risk of holding a position during the period, so don’t write your expected holding period in stone. The standard deviation is a measure of the dispersion of prices away from the average. The wider the spread, the higher the standard deviation. You measure the standard deviation from a moving average, and standard deviation measures the actual variance of each price away from the centerline. Range expansion: The highs and lows are getting farther apart; volatility is rising. Range expansion provides a bigger profit opportunity and an equivalent increase in risk of gain or loss. Range contraction: The highs and lows are moving closer together, and you may think that risk is lower, too. But this is true only up to a point — the point of a breakout. In this figure, the ATR indicator in the top window starts falling after the one-day big-bar rise that marks the beginning of the support line. You don’t know whether you can draw the support line until afterwards, but you can see the ATR indicator failing to match that spiky high and continue to fall. The price is rising, but the indicator is falling. And, as usual, a divergence between indicator and price is a warning sign. 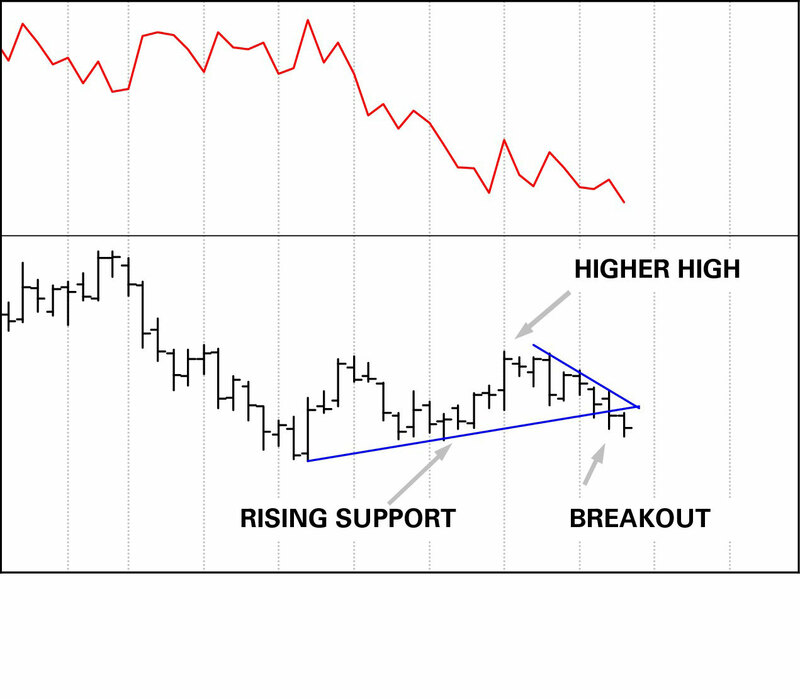 Sure enough, right after the highest high, you get a series of lower highs and can draw a resistance line. Pretty soon the price breaks under support.